"Welcome watchers of illusion to the castle of confusion. The immortal words of Treguard the Dungeon Master ring out for the first time in 20 years as he opens the doors to the world of adventure, but do you dare enter? 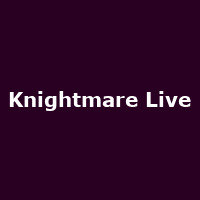 Following a sold out Edinburgh Festival run Knightmare, the cult TV show, is live onstage, and offers you the chance to don the immortal helmet of justice. Guided by two top comedians, an audience member will attempt to defeat Lord Fear's mighty dungeon in the greater game of chance. Riddles, magical characters and hideous monsters..."